I consider myself a morning person. However, when it comes to early morning flights, I am definitely not a happy camper. I never sleep well the night before in fear of missing my alarm, and my body always gets thrown off when I don't eat breakfast at home. Without a doubt, a 7:30AM flight implies you're eating breakfast on the go - either in a cab, at the gate, or on the tarmac. Flying to the States makes it even tougher, since fresh fruit and veg aren't allowed. I decided that the only way I'd be happy (aka not cranky), was to pack a tasty travel breakfast with me. Hopefully I can track down some yogurt, coffee and OJ at the airport, and I'll be good to go! 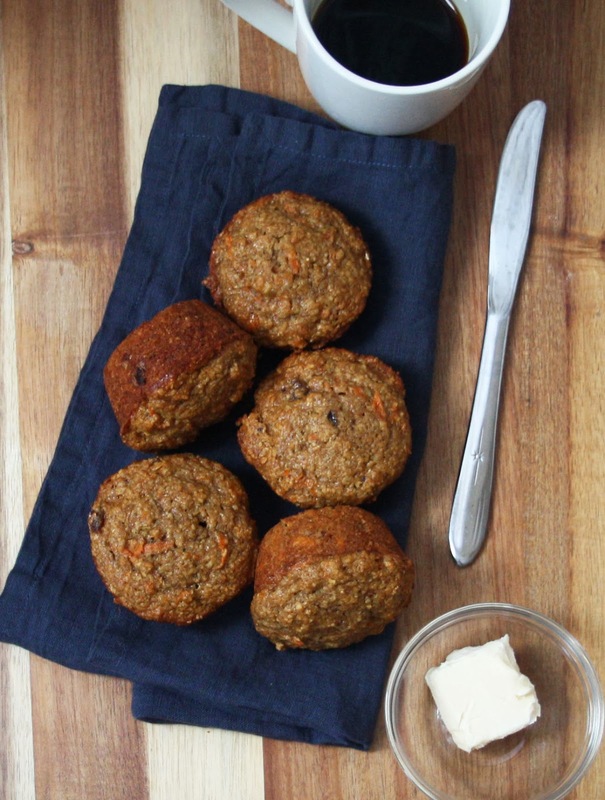 These muffins aren't overly sweet, making them a perfect breakfast muffin. If you're craving more sugar, sprinkle the tops with brown sugar just before baking. Also, I never have buttermilk in the house (hence the milk/vinegar combo), but if you do, by all means, use buttermilk! Chop the dates, grate the carrots, and set aside. To make the buttermilk, take a 1 cup measuring cup, add 1 tbsp of vinegar and fill to the top with milk. Set aside. In a large bowl, combine the buttermilk, melted butter, egg and vanilla. Whisk well to combine. Add the dates and carrots, stir to incorporate and set aside. In a separate bowl, mix all the dry ingredients, and guaranteeing there are no lumps. Fold the dry ingredients into the wet, stir just enough to combine, and let sit for 5 minutes. While the batter is sitting, grease your muffin tin (or line with paper liners). Scoop the batter into the cups, filling to just below the surface - use up all the batter as required. Bake for roughly 20 minutes, or until a toothpick comes out clean. Once removed from the oven, and cool enough to touch, gently remove the muffins and transfer to a wire rack.